Editorial: A German speciality, or a worldwide problem? Objective: To determine the quality of finishing obtained with removable clear aligners, measured using the American Board of Orthodontics system (ABO) or the Peer Assessment Rating index (PAR). Materials and methods: Electronic databases - PubMed, EMBASE, SCIRUS, SCOPUS and Cochrane Library from 1966 to the second week of September 2017 were searched. Methodological shortcomings were highlighted and the quality of the studies was ranked using MINORS, a validated quality assessment tool. Results: Four relevant articles were selected (a retrospective cohort study, a descriptive uncontrolled case-control study and two descriptive controlled case-control studies). OGS categories that had scores with a statistically significant difference between the groups were buccolingual inclination, occlusal contacts, occlusal relationships and overjet. In these categories, on average the group treated with removable aligners lost more points than the braces group. There was a statistically significant difference between the passing rate (ABO) of both groups, 20.8% of the clear aligner group and 47.9% of the braces group (P.0052). The ABO Model Grading System (MGS) showed significantly correlated scores (range 0.8 + 1.0; P < 0.05) for the categories buccolingual inclination, occlusal relations, and interproximal contacts. The alignment results (15.16 + 5.00 vs 6.00 + 3.78, P < 0.001) and buccolingual inclination results improved significantly (7.00 + 3.14 vs 6.26 + 3.58, P 1/4 0.024). The smallest change was found in the rating of interproximal contact. 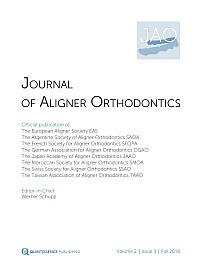 In the clear aligner and braces group, OGS scores reflecting mean points lost for deviation from ideal show that only the scores in buccolingual inclinations (-3.55 + 1.36 and -5.85 2.68, respectively) and in occlusal contacts (-1.88 + 0.13 / -3.90 + 1.12, respectively) were significant. Regarding the results obtained using the PAR index, no differences between the measures evaluated in both groups were shown, although no result was statistically significant. Finally, a significant reduction in treatment time was indicated using the clear aligner system (13.35 + 8.63 months), when compared with conventional appliances (19.08 + 5.92 months). Conclusions: OGS scores were similar in both groups for rotations, marginal ridge heights, space closure and root alignment, but clear aligners' OGS qualifications for occlusal contacts, posterior torque, and anteroposterior discrepancies were worse than those obtained with braces. When comparing MGS scores it was shown that those for Invisalign for the alignment, buccolingual inclination, overjet, marginal ridges and interproximal contacts categories showed overall improvements after treatment. Finally, despite it being shown that both techniques were equally successful in treating Class I adult extraction cases, treatment time for the clear aligner system was shorter. Objective: The purpose of this study was to evaluate the oral health-related quality of life and pain in patients with acceleration devices during orthodontic treatment with Invisalign. Methods: Thirty patients were randomly assigned to three groups: control group (without additional accelerating devices, changing aligners every 7 days); Acceledent group (with Acceledent accelerating device aligners, changing every 6 days); Orthopulse group (with Orthopulse accelerating device aligners, changing every 6 days). The Oral Health Impact Profile (OHIP) questionnaire was used after the orthodontic treatment to measure the OHIP. This was a modified self-administered short version of the German Oral Health Impact Profile (OHIP-G16) questionnaire. Results: Due to the reduced number of patients included in the study, as well as the individual differences in the groups, no sufficient statistical data could be obtained, but only trends stated. One trend seemed to be reduced pain both at the beginning of a new pair of aligners and during the orthodontic treatment in the Acceledent group and the Orthopulse group. Conclusion: The accelerated orthodontic treatment using the Invisalign system, with the help of vibrating or low-level light emitting devices, may reduce pain. The starting point for any orthodontic occlusion diagnostics, treatment planning and subsequent therapy should be the physiological mandibular position. A possible discrepancy between maximal intercuspation and occlusion in the physiological mandibular position should be carefully investigated. An unrecognised and therefore untreated temporomandibular dysfunction (TMD) nullifies the success of orthodontic treatment. If there are signs of a TMD in the short screening test, the following detailed functional diagnosis, possibly including the musculoskeletal system (MSS), is necessary. This also includes the diagnosis of analogue or virtual models mounted in a physiological condylar position. Cone beam computed tomography (CBCT) and sometimes also an MRI scan is needed to specify the diagnostics in some patients. The clinical cases of two young female patients presenting with a Class II dental malocclusion treated with the Invisalign technique in combination with Class II elastics are presented in this article. The first case showed a full dental Class II relationship, severe overjet, strong incisor proclination and an impacted maxillary canine. The second case displayed an asymmetric Class II canine and molar relationship. Both patients refused fixed appliances and chose aesthetic treatment options. Maxillary molar distalization was prescribed in the ClinCheck following a new protocol of 2 by 2 distalization. The new protocol proposed shortened treatment time and was effective to correct dental Class II malocclusion. Restorative dental and prosthetic treatment in patients demanding aesthetics and function sometimes requires an interdisciplinary approach. In fact, restoring lost or missing teeth often requires the involvement of orthodontic, prosthetic and restorative professionals. The Invisalign system is much more accepted by patients due to its excellent aesthetic and comfort characteristics, reducing the risk of plaque-induced periodontal problems. Invisalign therapy, combined with restorative procedures, is an ideal alternative to offering sound tooth tissue maintenance, offering a very conservative approach. In this article it will be shown how the combination of Invisalign aligners and restorative therapies may lead to a predictable result, especially in patients with severe tooth size discrepancies.